It is now time to consider how capitalist relations of production, from forms of development of the productive forces turn into their fetters. To this effect, the concept of ‘fettering’ will be examined first, followed by an explanation of the mechanisms which bring it about. For the original development of these ideas the writings of Marx, Engels and Lenin will be surveyed briefly, in the spirit also of whatever shifts of emphasis have been registered in Marxist writing subsequently to the works of the original contributors. 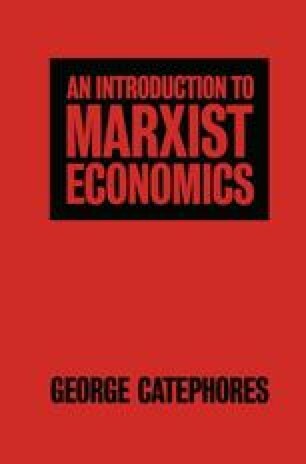 It is useful at this point to recall the distinction, attempted in the preface of this book, between an old and a new Marxist model. Of the laws of motion of capitalism, which make up the old model, two — the law of increasing severity of cyclical crises and the law of the falling tendency of the rate of profit — have clear ‘fettering’ implications. Their discussion in this and the following two chapters pave the way to the consideration of the transition from the old to the new model in Chapter 9. In parallel, the definition of fettering itself undergoes, as argued below, an evolution from classical to neo-Marxist notions.